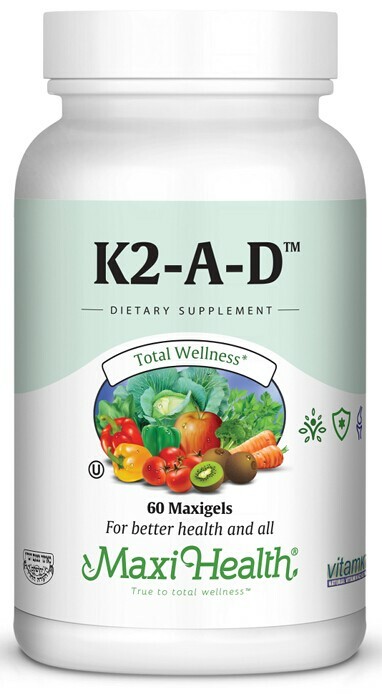 K2-A-D™ is a unique formulation for those who want to take their vitamin K2,D3, and vitamin A together. Not only is it more convenient but we offer you the best delivery method for these 3 vitamins....in an easy to swallow one-piece gel capsule with organic extra virgin olive oil. Not only that you can look forward to 100 mcg of Vitamin K2 as VitaMK7® Menaquinone-7. VitaMK7™ is known for its bioavailability. We use 3000 IU of both vitamin D3 (as cholecalciferol) and vitamin A (as retinyl palmitate). Now, it’s up to you. Get your K2, A, and D3 the easy way, K2-A-D™ from your health partners at Maxi Health. Take one (1) Maxigel up to two times daily with meals or as directed by your healthcare professional. Other Ingredients: Vegetarian Gel Shell (non-GMO modiﬁed cornstarch, carrageenan, glycerin, sorbitol, puriﬁed water, and caramel powder). This product contains NO wheat, salt, sugar, milk, yeast, gluten, artiﬁcial ﬂavors, colorings or preservatives. VitaMK7® is a registered trademark of Gnosis S.p.A. Directions: Take one (1) Maxigel up to two times daily with meals or as directed by your healthcare professional.